Occasionally someone asks, "What’s the point of competing in Kung Fu tournaments?" Well, it might just land you a role in a major Hollywood motion picture. But not just any movie, this is the worldwide launch of a potentially massive film franchise, based on a globally-successful videogame brand, and starring Oscar-winning and A-list actors. Occasionally someone asks, "What's the point of competing in Kung Fu tournaments?" Well, it might just land you a role in a major Hollywood motion picture. But not just any movie, this is the worldwide launch of a potentially massive film franchise, based on a globally-successful videogame brand, and starring Oscar-winning and A-list actors. Michelle Lin is a dedicated Kung Fu practitioner, one of the select pupils of Dr. Yang Jwing Ming's extraordinary YMAA Retreat Center deep in the ancient redwoods of Miranda, California. On December 21, 2016, Michelle made her big screen debut in Assassin's Creed, alongside such stellar actors as Michael Fassbinder, Marion Cotillard, Jeremy Irons and Charlotte Rampling. And she got there as a direct result of competing in the Tiger Claw Elite Championships. I had the chance to catch up with her just before she headed out to New York for the film's premiere. GC: How did you get the part in Assassin's Creed? ML: In June of 2015, the casting director's assistant emailed me and named some of the films they worked on including Harry Potter and War Horse. They were casting for a prestigious film directed by Justin Kurzel and starring Michael Fassbender and Marion Cotillard. She asked if I was interested and available. I assumed it was spam. Even if the email was legit, I thought I was too old, injured, and mediocre to do any stunts worth writing home about. To humor myself, I said I wasn't sure I had what they were looking for and asked for details. The assistant replied saying they showed Justin a YouTube video of my performance at the Tiger Claw Elite Championships and he liked my style and focus (To this day, I'm still not sure how my obscure videos came up in her search.) The role they were casting for was a modern-day assassin. At that point, I realized this was real. It was a chance to work on a popular badass videogame adaptation with some of the best professionals in their fields. How could I say no? At first, I thought I wouldn't be able to do the film because I was already committed to a 5 Year Training Program with Dr. Yang Jwing-Ming. He gave me his blessing so I prepped and I submitted my audition video. A few weeks later, I got the call saying I earned the role! GC: Who do you play? ML: I play an Abstergo prisoner named Lin. She's a descendant of Shao Jun, a 15th century assassin from Assassin's Creed Chronicles: China. GC: How did you find your character? ML: When I met with Justin during pre-production, he said Lin would be similar to who I appear to be – quiet and deadly. I did my audition reading as an experienced and disillusioned assassin. To show a little more color, I ended it by adding a few threatening lines and glaring at the camera. I suppose they liked it because Lin glares for most of the film. I also considered Shao Jun's life experiences since Lin has her memories. Both characters went through hardships at the hands of the Templars and Lin is waiting for the opportunity to unleash her vengeance. My personality isn't really that similar to Lin's (my friends may disagree), but I believe it could be if I was in her situation. I am quiet and shy when meeting people but nowhere near as vicious as she is. 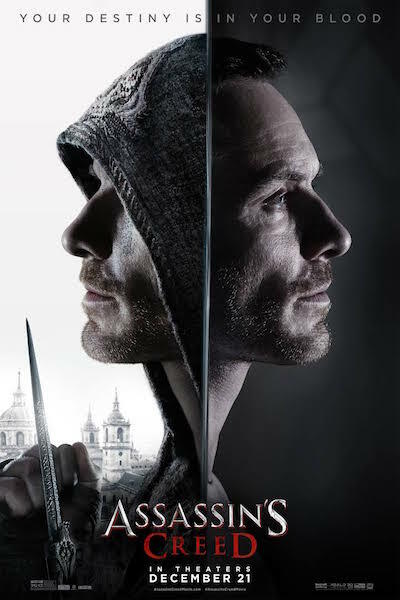 GC: Assassin's Creed has a great cast. Were you ever star struck? ML: No, I admire the hardworking and brilliant cast and crew but I try to treat everyone as regular people and focus on the task at hand. Privately, the kid in me was excited to be in the same film as Scar and Mad Eye Moody! One day on set, I realized I was fighting Templars (including Kickass) with comic book superheroes (stunt doubles) on my side and that was pretty sweet. GC: How much did your martial arts training play into securing and performing this role? ML: I'm fairly certain that being a full-time student at the YMAA Retreat Center was a big factor in my earning the role. We train about 8 hours a day in meditation, Qigong, Taijiquan, and Shaolin Kung Fu. It wasn't so much due to the physical training as it was the events, people, and personal choices which have made me the person I am. Performing and competing helped me become accustomed to being in front of a crowd. It's still no walk in the park, but I have more confidence than before. The character's physical movements were partially based off of the styles I train and the way I move, but stunt work is an entirely different art and skill. It's almost the opposite in the sense that you follow the choreography for the camera and the audience. Martial arts tends to be more subtle and interpretive and eventually the practitioner makes it her or his own. Martial arts practitioners constantly face mental, physical, and emotional trials and I accepted acting, stunt work, and working on a high profile film as new and exciting challenges. When I struggled, I had to refocus, find my center, and keep going. GC: How long were you working on this film? ML: I was in London for 12 weeks, filming sporadically for about one third of the time. (It made sense to keep me there instead of flying me back and forth from California to London.) I later returned for 3 weeks of reshoots. GC: Did you aspire to working in the movies before this? ML: As a teenager practicing martial arts, I was one of many who fantasized about being in an action movie. It didn't go beyond that and I thought my path was set on training at the Retreat Center to become a teacher. However, deep inside I always believed I could work on a film if I really wanted to. Whether or not I could do it well is a different story. When the opportunity to audition and later perform in the film came along, I did my best. If I didn't believe in myself, I never would have earned the role. GC: Do you have prior acting experience? ML: Not on a professional level. For fun, I've done skits and took Intro to Acting when I was at Tufts University. As filming progressed, I realized that I act every time I do solo martial arts practice. We're always training sense of enemy, which is imagining we're facing an opponent and reacting with practical techniques for the situation. GC: What was the most challenging aspect for you working on this film? The most challenging aspect was my lack of experience and feeling like a fish out of water. Sometimes actors have specific instructions on how to play a scene but other times they're allowed to explore different options. For the few non-physical scenes I had, I would have liked to have had more ideas on how to play them but that comes with experience. I also missed being on the mountain and having my regular training routine and partners. GC: Did you play the Assassin's Creed videogame? ML: No, but I had seen my friends play it. I'm terrible at video games and it might take me an hour to climb a wall. GC: How did you prepare for the role without playing the game? ML: I researched to get an idea of the Assassin's Creed universe and watched walkthroughs to understand how the characters move. My character's ancestor trained Northern Shaolin and specialized in kicks, sword, projectile weapons (needles and darts), and rope dart. Conveniently, one of the styles I train (Shaolin Long Fist) emphasizes kicks and has several sword sequences, so I focused on training them. I learned some rope dart basics but you need years to become proficient at it. For the mental and emotional aspects, I put myself in my character's shoes and thought of different ways she could behave and react in those scenarios. To better understand Shao Jun, I watched "Assassin's Creed: Embers," where she travels to find Ezio Auditore to learn from him. GC: You were the first female to commit to Dr. Yang Jwing Ming's 5 Year Training. How is that going for you? ML: The program has been a learning process in so many ways. In addition to trying to cover massive amounts of material, we're also learning to become teachers, developing our curriculum, living in a shared space of over 15 people, and juggling other responsibilities. There is never enough time and there are plenty of challenges. However, it's a huge honor to train with Dr. Yang and the other students and one the best decisions I've ever made. We've learned a lot about ourselves and continue to grow. GC: Did working on Assassin's Creed affect your Kung Fu training? ML: It did and I had hesitations about taking so much time off before I decided to audition. It was Dr. Yang who reassured me that we have our whole lives to train. We're always practicing in some manner, so I found different ways to keep training. In the end, working on the film was a unique learning experience that I am extremely grateful for. GC: Do you plan to do more work in film? ML: First, I'll see how I do in this film. If another opportunity approaches, I'll consider it. GC: What's next for you? ML: In the big picture, I will continue training at the Retreat Center and teach after the program ends. There is flexibility in the details and I'm open to other opportunities to learn new skills. Gene Ching is the author of the above interview with Michelle Lin. This article is reprinted by permission, © 2016 KungFuMagazine.com. The full article may be found at KungFuMagazine.com. Michelle Lin began her training as a child at YMAA Andover school in Massachusetts. She is now a student in an intensive 5-Year Kung Fu Training Program at the YMAA Retreat Center in Northern California. She trains in kung fu, tai chi, and Chinese culture with daily lessons from Dr. Yang, Jwing-Ming. After being spotted on YouTube performing kung fu in a martial arts Tiger Claw Elite Championship tournament, she was selected for a role in the film Assassin's Creed. She spent 12 weeks filming in London as the Northern Shaolin character Lin, a quiet and deadly assassin. Michelle also holds a bachelor degree from Tufts University.